a. ^ Prior to 2002, the national currency was the Dutch guilder (ƒ). 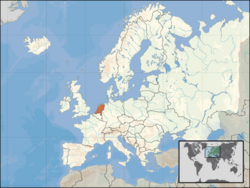 The Netherlands (Dutch: Nederland), officially the Kingdom of the Netherlands (Dutch: Koninkrijk der Nederlanden) is a country in the northwest of Europe. It borders the North Sea, Belgium and Germany. 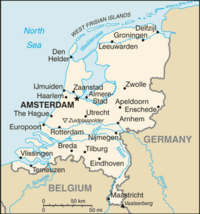 It is also referred to by the collective name of its two main provinces: Holland. Its capital city is Amsterdam. This page was last modified on 2 September 2012, at 18:18.